I picked Marriage Under Fire up during the CBD Christmas special. It definitely had appeal to me, as I care greatly about the institution of marriage. I don't always like how Dobson presents his arguments and do not agree with him in everything, but I know that he, too, is passionate about the covenant of marriage - being between one man and one woman. 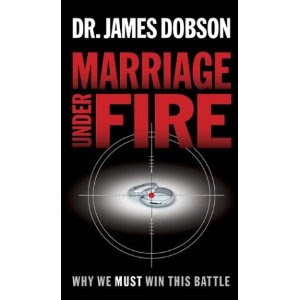 Marriage Under Fire was originally published in 2004 and is written to address and explain the political climate at the time. For that reason, the book is slightly outdated -- in part. The political situation has obviously changed but I would hastily also say that the war against the God-ordained institution of marriage is just as much under attack now as then. Perhaps more so. Dobson's 2004 rallying cry that we sit up, take notice and defend our beliefs is still applicable today. One thing I think he addresses well is why we should care about the legalization of homosexual marriages. A lot of people would say, "Why should you care? It's not hurting you, is it?" and Dobson says that we cannot ignore it. To allow it is to usher in the destruction of the traditional marriage. It opens doors to allow anything and everything because if you say that marriage is not just between a man and a woman that you can easily drag the argument out further to say that marriage can be between three or four people, or a man and his dog, or any other odd combination that might spring to mind. Once you remove the standard, then you are subjecting yourself to the whims, fancy and experimentation of the masses - which is exactly what we see happening today. Dobson calls for a return to marriage the way that God designed it - between one man and one woman. This, he argues (and I agree) is the way to stabilize society, as well as strengthen it. I know this argument is not a popular one these days. I know there are cries for tolerance every which way you look. I know that people didn't like Dobson writing this book in the first place, let alone will they appreciate finding this post online. This may very well be the case but that does not remove my right to share my own opinion. So before the hagglers start howling in the comment section, remember to be kind and that this is my blog. We have equal rights to our own opinions. If you can talk, so can I.
I do believe that God designed and established marriage to be between one man and one woman. I believe that society falters and is gradually destroyed when we step away from that model. I think divorce and homosexual relationships are harmful to children and remove feelings of stability and safety from them. Generally speaking, this results in children feeling scared, alone, uncertain of themselves and leaves huge emotional scars for family members across the board. I recognize that there is a spirit of individualism loose in society and that no one really appreciates being told what to do. We've latched onto relativism, saying that there is no truth and what is right for one person might not be right for another. We use this argument liberally, without realizing that to say there is no truth is to say there is. In other words, the argument doesn't hold and is not reliable. There has to be a standard and there has to be a truth. Without one, society is chaos. We are just beginning to feel the effects of that chaos. If you do believe in God's design for marriage, I do think Dobson's call is right on in saying that we need to be brave enough to stand up and say so. He does not mince words and assures the reader that if you dare to take a stand, you will be attacked for it. People do not like being presented with a standard and/or a solid opinion that differs from their own. It isn't pleasant, but if we care to preserve traditional marriage then we'd best be prepared to stand up and speak politely, yet firmly, and without apology. It is certainly difficult. But I think it's the right thing to do. Taking that stand is often ugly, but needed. Good post. Thanks for sharing about a good book. Thanks for your post! I am definitely on the one man-one woman side of the argument!!! Agree with you, Carrie. I think one day we will have to answer for the things we didn't, like you said, politely, yet firmly, without apology, take a stand on. Thank you for sharing. Your words come through with sincerity and clarity. Our pastor is doing a series on biblical guidelines for marriage. I was shocked to hear that a couple of countries have instituted renewal dates for marriage licenses and there is an online push to have that in the U.S. Can you imagine? Just like a driver's license, your marriage license might only be good for 7 years. If you don't renew it, the marriage dissolves. I agree with the definition of marriage you endorse, which is why I don't get terribly stressed about legalities. (Maybe that's also why I'm not a lawyer) As Abraham Lincoln put it, "If you call a sheep's tail a leg, how many legs does a sheep have?" "Four- calling a tail a leg doesn't make it so." I expect studies will be done on the children of homosexual couples and that the children will be mostly heterosexual and more educationally/professionally successful than average. It's very challenging for two homosexual men to adopt and most of those who do will be committed, dedicated parents. In addition, only a very small percentage of those couples seek to adopt. The "bar" to become a heterosexual parent is, umm, much lower. Taia - All I'll say on that one is - it's a heckava journey to adopt as a heterosexual couple. Not exactly easy by any stretch of the imagination. And no doubt there will be studies. But studies and the culture constantly changes. So I would prefer to stick to a standard that never changes, rather than speculate on studies. I think I hear what you are saying and so that would be my response. I think Dobson fails to address how to create public policy. Public policy is usually grounded in studies and culture. The legalization of gay marriage is a question of public policy, not of how God defines marriage. I think Dobson's predictive/statistical correlations are weak. My thinking is that, in allowing the government to tell us who's married and who isn't (in the case of unjustified divorce, for instance), we've opened the door to them changing the definition altogether. It's depressing, but I think we'll lose this battle.